The Sydney Amma Group meets several times each month for regular “satsangs” – free programs of spiritual talks, devotional singing, meditation and prayer in a warm, friendly atmosphere. 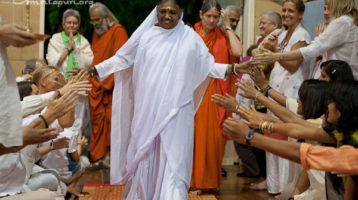 There are also Fundraising dinners, “Archana” (chanting the sacred names of the Divine Mother) sessions, as well as special events throughout the year. The Sydney Amma Group is also involved in activities such as Mother’s Kitchen, a rostered volunteer service providing free meals for the homeless and disadvantaged. See below for more information, latest news and tour updates, or read our latest Newsletter. Books, photos, CDs, videos and general information about Amma, as well as fundraising and community activities are also available at the Sydney Amma group. All are welcome! Where Various locations – see Calendar for details. Where Rough Edges Community Centre, Darlinghurst.